My logic: If I’m burning fossil fuels, then I should make some gesture to pay back and support sustainable projects that wouldn’t have otherwise occurred. Apart from Global warming, carbon from fossil fuels goes straight into the ocean, causing ocean acidification. That kills ocean life – direct causal correlation. For cars, we can choose to drive hybrids and fully electric. If there was a choice letting me fly electric, I would take it. At the meta level we must demand more research dollars from our governments to support alternative energies. I love flying Harbour Air. They are a relatively small company, the world’s first all-float plane airline. They are consistently voted among the top Employers for BC and in the top 50 best managed companies in Canada. Here is Alicia Schwarz, the Vancouver and Comox Base Manager at the downtown Vancouver terminal. Harbour Air fly otters and beavers (those are types of planes not furry mammals). The Harbour Air folks are professional, courteous and happy to accommodate, I often call panicked, stuck in traffic “I’m close to the cut-off for check-in, pleeease pleease dont sell my seat”. I’ve never missed a flight (for that reason). Their flights are simple to book and cancel if your plans change last minute. Air Canada – are you listening?. I happened to see Alicia last week and asked her how her day was going. She had spent the morning at a conference being inspired to do better and be better. In April, I bumped into a big group of the Harbour Air team and hitched a ride with them to attend a fantastic leadership conference. Just this past Wednesday, I heard Canadian businessman Brandt Louie give a talk. He said that if you hire just one good person, they bring in three other good people. Conversely if you hire one bad person they bring in three bad people. I agree with Mr Louie but see it in terms of energy. Good energy creates more. By focusing the conversation on the positive, we can accomplish so much – and enjoy doing it too! Guess who else buys carbon credits from Offsetters? Harbour Air! They lead the aviation industry in sustainability. I want to highlight them as example of what every airline should do: go carbon neutral. 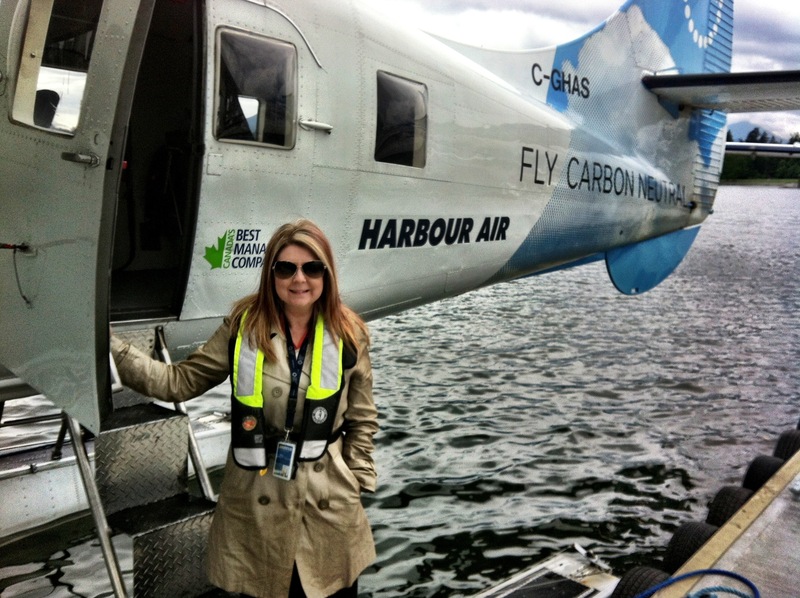 Instead of pumping profits only to shareholders, Harbour Air invests a portion back into the planet as part of their business model. It’s working! Shouldn’t everyone do this? Shouldn’t every company do the same? Hang on – brainflash! Shouldn’t that be made into a law? Imagine every company giving back for our planet? Imagine how wonderful that would be? This entry was posted in Sustainable Business, The Environment, Trail-Blazers and tagged Alicia Schwarz, Best employers, Best managed companies, Brandt Louie, carbon credits, carbon neutral, Harbour Air, Offsetters, Sustainable Business on May 28, 2013 by Gurdeep Stephens.